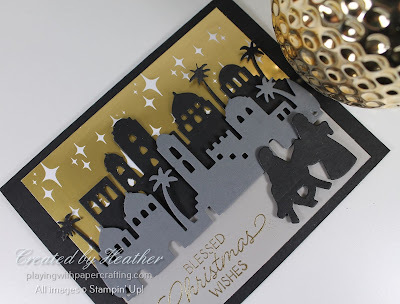 Playing with Papercrafting: August Night in Bethlehem! 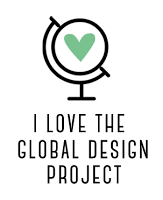 I am working on my first Christmas Buffet class coming up in two weeks time, and although I just did my first pre-order from the new Holiday Catalogue, I still don't have the products. 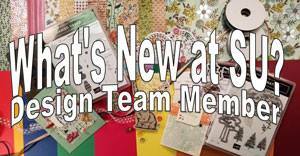 I'm relying on items from the Annual Catalogue to complete a few cards to get a head start. Also, my customers won't be able to purchase any of the new sets until September, so I don't want to use too much of what they can't buy themselves yet. The set I used in this sample is Night in Bethlehem, coupled with the coordinating Bethlehem Edgelits dies. Actually, aside from the sentiment, it's all the Bethlehem Edgelits dies. 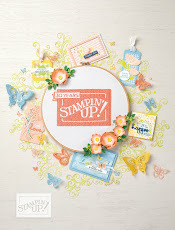 But I was able to use some of the Broadway Bound Specialty Designer Series Paper in the background as well. 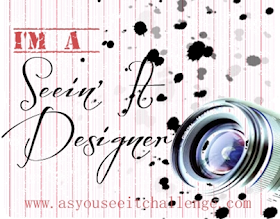 Isn't that design perfect for this Christmas card? The dimensions of layers are slightly altered from the regular measurements that would typically be used. This is because of the width of the edgelits . They cut a width of 4 3/4" across. 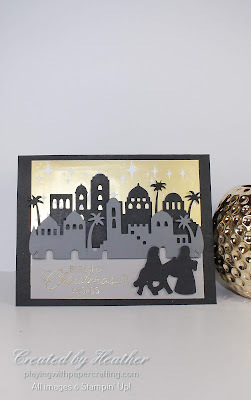 Normally that would lead to a height of 3 1/2", but more height was needed on this card to fit in the night sky, two layers of the village and then the sentiment and Mary & Joseph at the bottom, so I made the height 3 7/8". The Broadway Bound Specialty DSP at the back makes a perfect starry night sky and the gold is echoed in the gold embossed sentiment in the bottom left. The sentiment is the one element from the Night in Bethlehem Stamp Set. 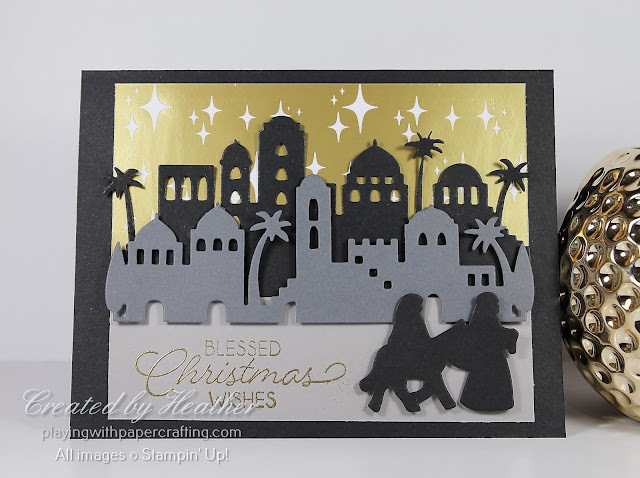 The three layers of village and road are three different colours of cardstock in order to distinguish them from each other: Basic Black, Basic Gray and Sahara Sand for the road. The black layer is glued down and the second layer is mounted on Stampin' Dimensionals for some depth. Mary & Joseph are also mounted on dimensionals. This Promotion is almost over now! 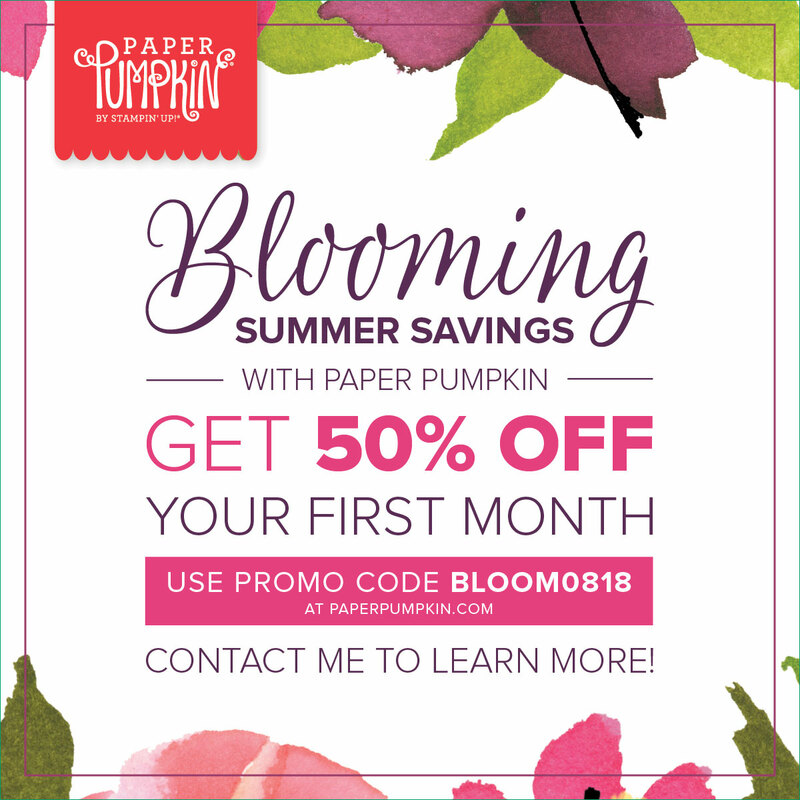 You only have until August 10 to sign up for your first Paper Pumpkin subscription in order to get 50% off your first month's subscription. 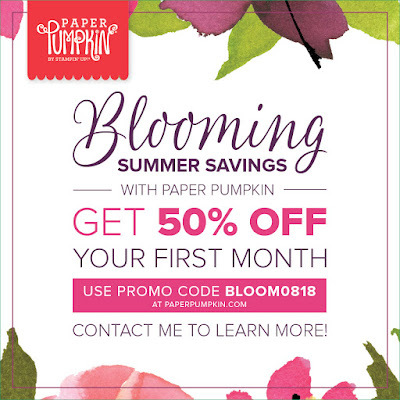 Just use the Code: BLOOM0818 when subscribing at paperpumpkin.com.